One of biggest influences in my decision to choose GSSW derived not only from the exceptional program and the opportunities to work within such a diverse community as Denver, but also the opportunities that abound in the lush Rocky Mountains. I’ve been an avid snowboarder for the past ten years, and the prospect of moving to a place that offered the urban flare yet was still within a short morning’s drive to the hills was something I simply couldn’t pass up! Also, by being a student here at DU, I’ve been able to afford multiple trips to multiple mountains by purchasing the Rocky Mountain Super Pass and apply an enormously large student discount-making these trips worthwhile AND affordable. While I’m still relatively new to the range (I did most of my riding in the Sierra’s) I have been nothing short of impressed at the variety of riding opportunities-from several different trail options, trees, moguls (for you skiers out there) and compared to my California trails, these runs seem to go on forever! My favorite resorts so far have been Copper Mountain and Mary Jane (the sister mountain to Winter Park Resort)-both within an hour and a half drive from the city. Does it get any sweeter than that?! It’s all smiles at Copper! My first run EVER in the Rockies! If you have a niche for hitting the slopes and are considering it as part of your graduate school relocation, than believe me when I say Colorado is nothing short of mind-blowing. This past Monday, Americans all over the country commemorated the legacy of Martin Luther King Jr. with parades, community service activities, rallies, and marches. The citizens of Denver were certainly no exception as the city hosted its 29th Annual “Marade,” the largest gathering in the nation to honor the influence MLK has left on our country’s civil rights history. Being a member of GSSW’s Queer Equality Alliance (QEA), I had the opportunity to collaborate with my peers and colleagues to participate in the Marade (a two mile march through bustling streets of Denver), carry a six foot banner, and proudly represent not only the institution of DU, but also pronounce my belief that there are still rights being withheld from individuals all over this country-ones that are worth fighting for. The Marade itself was spectacular-it was so powerful being in the midst of so many individuals listening to the inspiring words of MLK, many applauding the progress we’ve made, many hanging their heads in prayer for the long road we still have ahead. As the Marade ensued, political parties lined the streets touting their campaign efforts, sports teams cheered in unison, journalists snapped photos of the event. I felt blessed to have taken part in the experience. Being a student at University of Denver, especially in the Graduate School of Social Work, numerous opportunities are afforded-many of which include community involvement and support for those individuals who may not otherwise have a voice. QEA is one of many students groups in this program who are serving the graduate community (and the larger community of Denver) to represent the importance of celebrating diversity and fighting for equal rights. Below are some photos taken from this week’s Marade! Sometimes when I am stressed with school, work, and internship it is helpful to take a day trip to appreciate the awesome things that this location has to offer. Here are some suggestions to get you started. It is only about an hour away and it is free. It is a must see park in Colorado and has lots of great hikes for all different levels of ability. 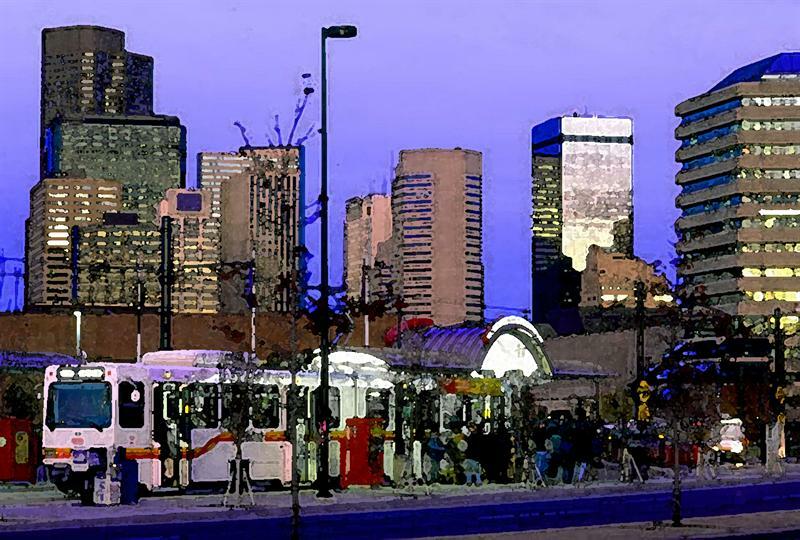 Take advantage of your free RTD services, jump on the BV, and bus yourself up to Boulder. One of my favorite things about Boulder is the amazing happy hours, food happy hours that is. While dining in Boulder can be a bit pricey at times many Boulder restaurants have created happy hour menus that cater to people on a budget. Two of my favorites are The Med and Brasserie Ten Ten. They are both located near Pearl Street Mall where you can stroll around afterwards working off everything you ate. If you are up for a long day then this is one for you. It is quite a drive but totally worth it. It is between a 2-3 hour drive and can be made into a 2 day trip if you aren’t up for driving there and back in one day. I would recommend doing this day trip in the fall when the trees are changing colors and the mountains are gorgeous. It makes the drive seem much shorter. Hanging Lakes isn’t a hike for the faint of heart but if you take it slow most people should be able to do it. It is a short but steep hike up to a gorgeous lake and waterfall. It you are a geology fanatic you may want to look at the unique rocks around the area as well. It is between a 1-2 hour drive. Again, it is a great place for camping if you want to make it a two day trip. There are endless opportunities at Rocky Mountain National Park. Stopping by the visitor’s center is a great way to start. The park rangers are very helpful in recommending a trail or pointing you in the direction of where wildlife has been spotted that day. If you aren’t the hiking type you can drive right up Trail Ridge Road and get spectacular views with barely having to move your feet. Fort Collins is a little over an hour north of Denver. There are a lot of fun things to do in Fort Collins. There are lots of little shops, restaurants, and breweries around the area. You could also hit up the drive in theater to end the night. Sesquicentennial Event: Surviving the Srebrenica Genocide. The first time that I walked through the Genocide Memorial Cemetery in Srebrenica-Potočari, Bosnia, I was struck by how peaceful it felt. The surrounding hills were beautiful, wild flowers were everywhere and the sky was impossibly blue. Rows of thousands of white tombstones, however, made me quickly realize that what happened in that place in 1995 was anything but peaceful. It was there that thousands of men and boys were slaughtered in the worst genocide in Europe since WWII. As the Director of DU’s International Service Learning Bosnia & Herzegovina (ISL BiH) program, and the faculty lead for The Social Work Response in Post-War Bosnia course, I have since had the opportunity to visit Srebrenica many times when I bring DU students to Bosnia each summer. During these trips, we have the honor of working with Hasan Hasanović, the curator and interpreter at this memorial. Mr. Hasanović survived the 1995 genocide, although most of his family did not. I have always hoped that he could come to DU where he would be able to have an impact on so many more people than just those who come with me to Bosnia. We are so fortunate to be hosting him as part of the DU Sesquicentennial. The world promised that the Holocaust would be the last genocide. Fifty years later, it happened again in Bosnia. The world knew it was happening, and the world stood by. Mr. Hasanović has an important story to tell about the human experience of war, genocide and resilience of spirit. After listening to him speak, we will all be challenged to think about our responsibility toward the innocent victims of war, genocide and other human rights violations. I hope that you will join us to hear this remarkable man tell his remarkable story. He will be speaking at the DU Graduate School of Social Work in Craig Hall on Wednesday, January 29, at 4:30. Please click here for information and registration. The Graduate School of Social Work in partnership with the University of Denver is pleased to announce Mr. Hasan Hasanović to the Graduate School of Social Work for this unique visit. 2014 marks the University of Denver’s Sesquicentennial and “Surviving the Srebrenica Genocide” a first-person account is one of many events honoring the university’s anniversary. Hasan Hasanović is currently the Curator and Interpreter of Bosnia’s Srebrenica-Potočari Cemetery and Memorial Centre. This remarkable event will be happening on Wednesday, January 29, 2014 starting at 4:30pm in the Boettcher Foundation Community Room of Craig Hall, home of the Graduate School of Social Work at the University of Denver. Craig Hall is located at: 2148 South High Street, Denver CO 80208. Please direct questions to Richard Bishop at (303)-871-3615 or Richard.Bishop@du.edu.